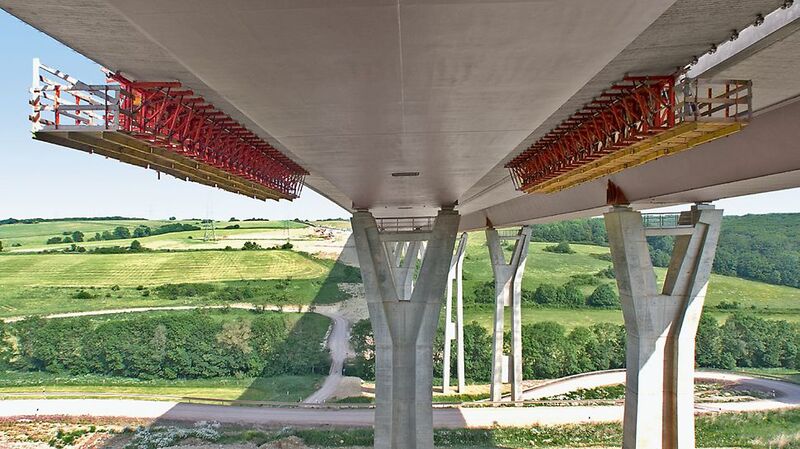 Just as different as the methods of bridge construction are the requirements regarding the production of cantilevered parapets. 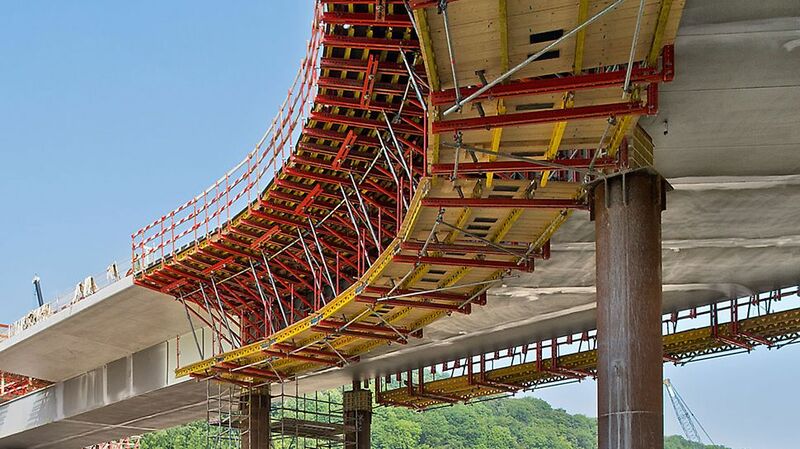 Many circumstances influence the choice of the formwork systems for an optimal construction process. 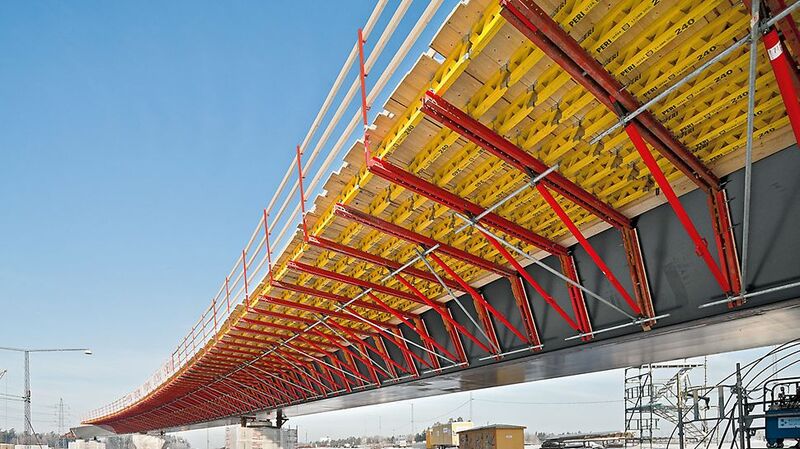 Here, a carriage travels on the completed superstructure and features 5.50 m long formwork sections in standard cases. 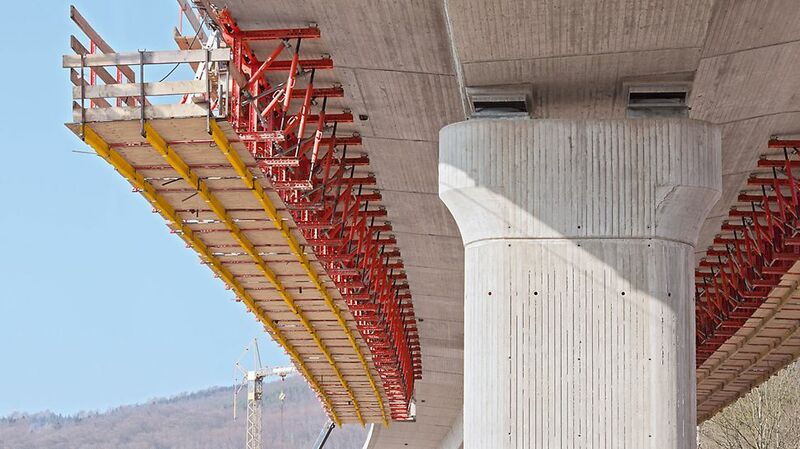 Several carriages are coupled together in order to achieve the required length of the concreting section. The carriages move by means of heavy-duty rollers on the U-profiles positioned on the bridge. The loads are carried on a gallows construction and ballast. As a result, no anchors are needed in the superstructure. With this configuration, parapets can be realized up to a height of w/h = 50/80 cm. For this, the ballast is merely modified for the respective loads. Larger parapets can be realized thanks to the VARIOKIT modular construction kit as well as by simply changing the geometry on the carriage. The parapet track moves on rollers which are attached to the lower side of the cantilever. These rollers can be mounted to the superstructure during the process via an advance platform and can be retrieved again on the finishing platform. This means no additional access to the lower side of the bridge is required. The complete superstructure is free of obstructions, which positively influences the construction process. The anchoring of the roller bearings is done with the PERI M24 anchor sleeve, which is already mounted during the concreting of the superstructure. By transferring of the complete concrete loads via the roller unit and also because of its easy and intuitive operation, short cycle times are possible. 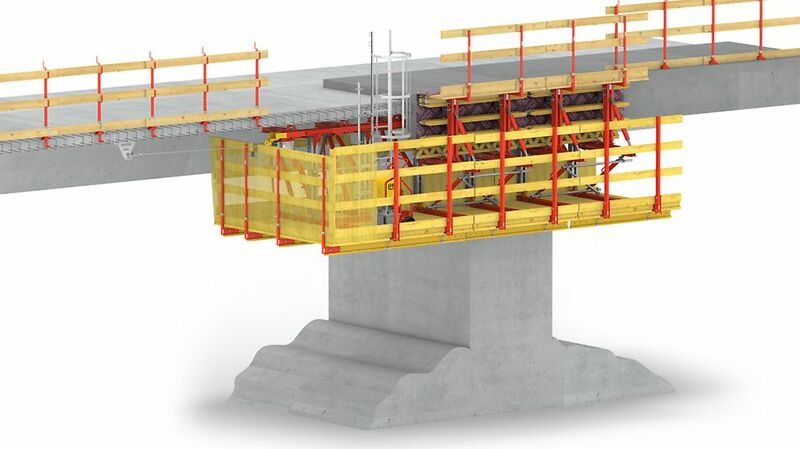 For shorter bridges that do not justify the effort of mounting a carriage or a track, the cantilever parapet bracket represents an efficient and economic formwork solution. 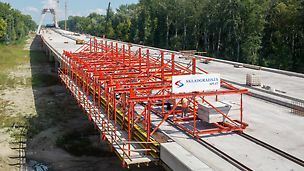 Thanks to the separation of working platform and formwork unit, the VGK cantilever parapet bracket is optimally catered to the requirements of bridge refurbishment. The brackets are attached to the lower side of the cantilever and further in the process are supplemented with planks to form closed platforms. After this, the formwork can be safely and comfortably assembled and aligned – even after the possible demolishing of the old cantilevered parapet. 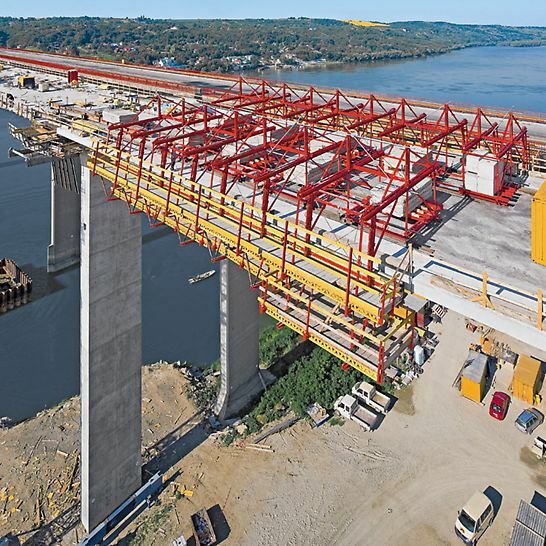 For the construction of new bridges, the PERI M24 anchor sleeve is already mounted in during the concreting of the bridge for the anchoring of the brackets. 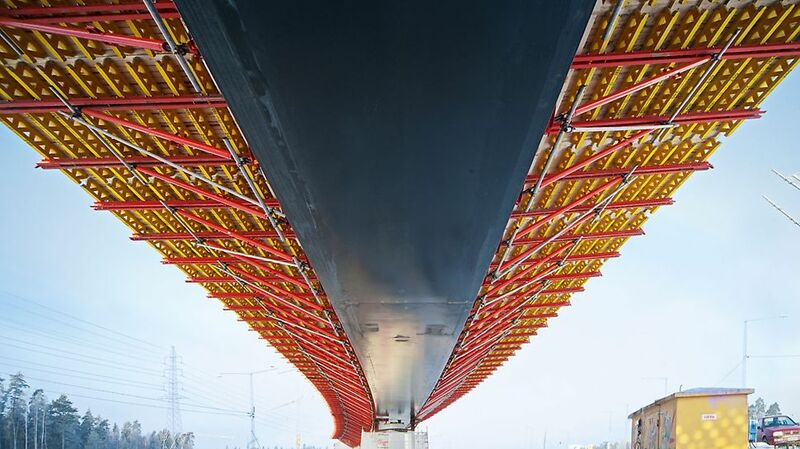 For bridge refurbishment, subsequent anchoring systems can be used.